Are you ready for a whiter, brighter, youthful smile? Have you ever wondered how the movie stars get their glowing white smiles and wished that you could have their teeth? Do you hide your smile with your hand or hate to smile in pictures? It is possible to get the “wow” whitening results that you have always wanted. Dentists have combined and researched several different bleaching techniques to develop a unique bleaching technique that is called extreme bleaching. Stains on teeth can be caused by so many things. As people age, the protective outside layer of your teeth called enamel wears down and the natural yellow or brown underlying dentin shows through. Dark food and drinks such as coffee, tea, red wine, fruit juice, soda, and berries can stain your teeth. In other words, anything that can stain your carpet can stain your teeth. Minocycline and tetracycline if given at a young age can dramatically stain your teeth a bluish gray. Poor oral hygiene can also cause bacteria to build up and stain your teeth. No matter what caused the staining, most can be dramatically improved by extreme bleaching. Best of all, you do not have to give up your dark drinks forever. However, we do ask to limit your intake during the bleaching process. Extreme bleaching is not a drive–thru experience and is not a one-hour procedure. Do you want something done fast or do you want long-lasting white teeth? 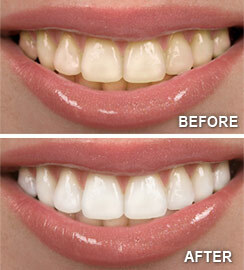 Extreme bleaching will give you permanent whiter teeth every time with a little at home maintenance. An exam with X-rays and a cleaning is required. The bleaching works much better when a cleaning is done prior in order to remove dental plaque or tarter. You must be cavity free. Fillings may also be recommended on the gum line to reduce sensitive teeth before bleaching. Sometimes crowns or fillings may need to be replaced after bleaching because they will not change their shade. Elective procedures such as whitening are not recommended on pregnant women. Deep bleaching is specific to you. Not everyone’s teeth are the same shade, so some may take longer than others to bleach. The dentist will work to get your teeth as white as you want them to be. After your exam and cleaning, “before” pictures are taken to get a shade. A mold is then taken to make a custom, comfortable tray for you. You are now ready to begin. Part of the extreme bleaching process includes an in-office bleaching procedure called Zoom!, which was created by Dr. William Dorfman. Zoom! has been shown on the television show Extreme Makeover. Zoom! 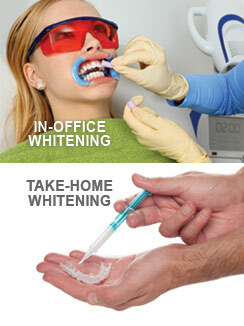 is a one-hour, in-office bleaching applied by a hygienist. Your lips and gums are covered and bleach is applied to your teeth every 15 minutes while you relax under a light. The Zoom! light activates the gel that is applied, allowing the hydrogen peroxide to penetrate your teeth better. The Zoom! procedure is combined with other bleaching techniques to give you the “wow” that you are looking for.